Tip Number 1: What if you are a passenger in a car, happily knitting away and you drop a stitch. You can use a hoop or French wire earring to hold the stitch until you can pick it up. 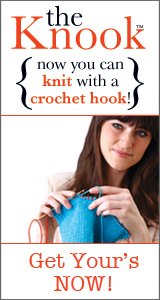 Always keep a crochet hook handy for picking up stitches that may have slipped off your needles. Tip Number 2: If you don’t have a cable needle handy, use a short circular needle or a paper clip will work too, to hold your stitches. Tip Number 3: Paper clips can be bent and made into stitch markers while crocheting and knitting.